While running some errands in our neighborhood, I spotted a very modest roadside table. The sign on the front read ROCK SALE. I just had to stop. 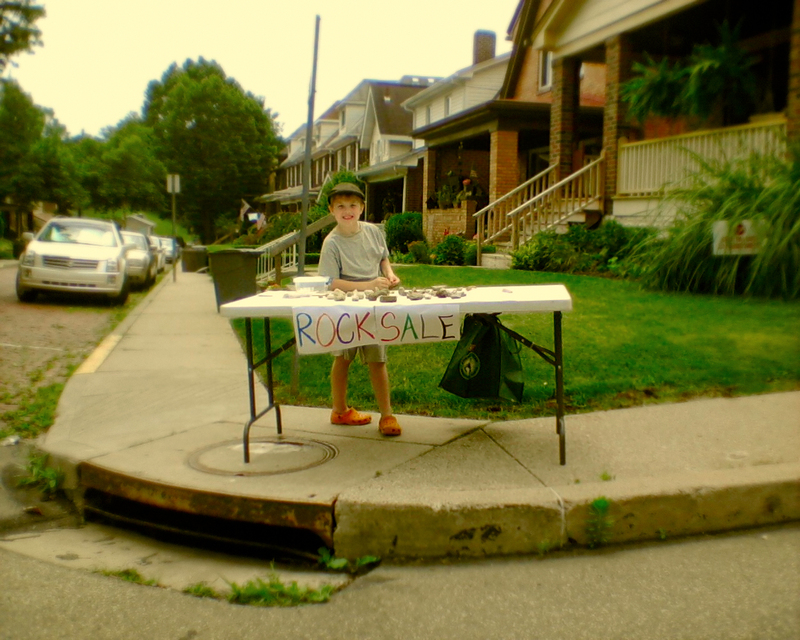 Jack shrieked with excitement when he realized that not only were there rocks on sale, but that the crafty businessman behind this enterprise was one of his schoolmates. 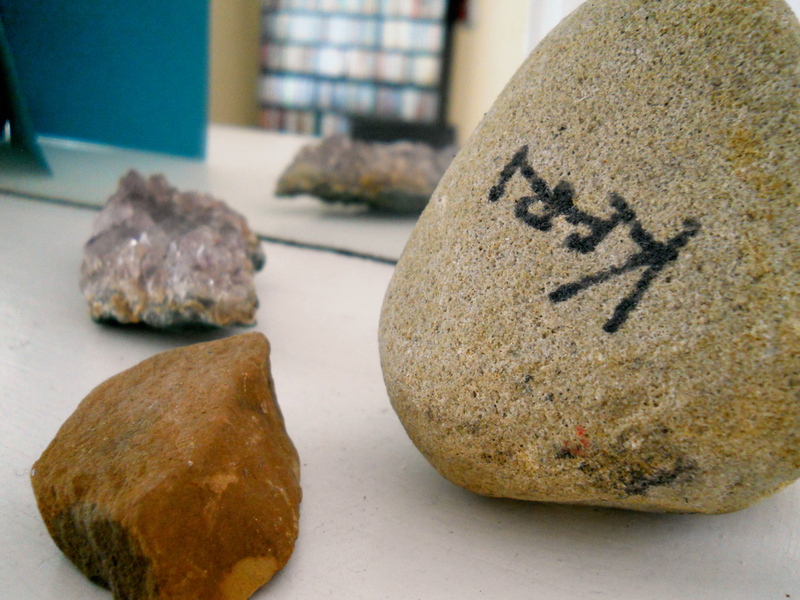 The modest collection of rocks, bobbles and gems barely filled the surface of the table, but the caliper of rocks on display seemed carefully chosen and collected throughout this particular seven-year old’s lifetime. We met Connor on the second day of school. He was running late, his hair was wet, and he was racing to get in line for the bus. He had lumbered through the neighbor’s front lawn to get to his destination while screaming something to the effect of “I’m here, I’m here, I’m here!” His ornery face made me chuckle to myself. I liked him instantly. Connor waved us towards his table of trinkets. 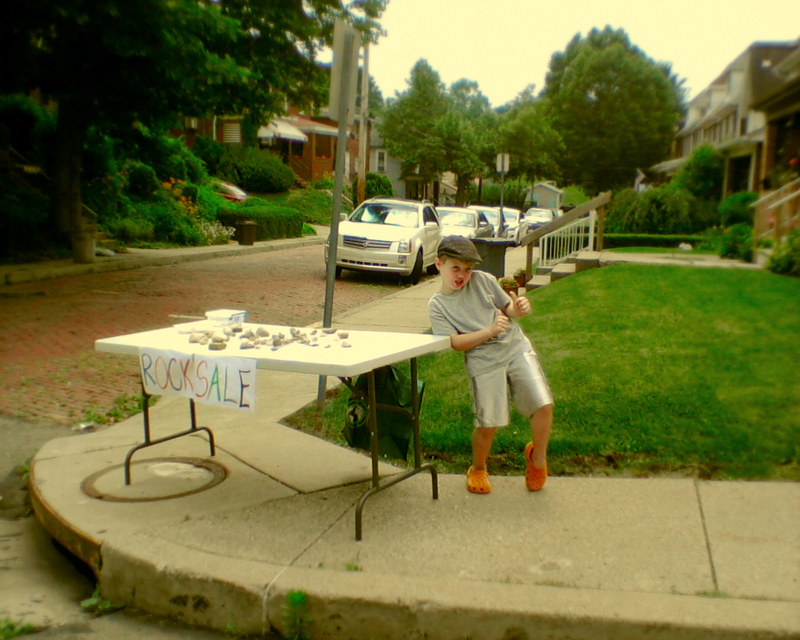 As I pulled over, he was chanting about his wares like a professional Carnival Barker. “Rocks for Sale! Get your rocks here! Only 25 cents!” According to his mom, this venture was all his idea. I listened to him sweet talk the lady next to me. She was very interested in the stories he had to tell about the stories the rocks he was selling. I merely asked which ones were his favorite. Gently goading us into realizing our would-be rock’s full potential, he mentioned we should paint them and turn them into something colorful, beautiful. Connor is going to make one hell of a business man someday, I thought. We carefully selected our “perfect” rocks. I was pleased with my choice. It looks like the floor from 1960s bank… or the bathroom floor of my old apartment. 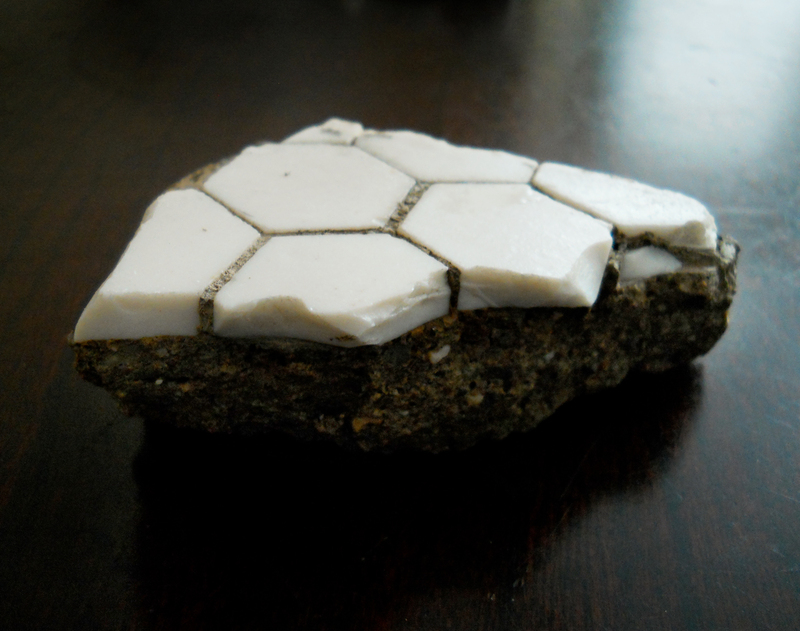 I spent the better part of the 90s collecting my own set of memorable rocks. I collected them from places that seem to note some important juncture or event in my life. Sadly, I have forgotten the significance of most of the gems that have been collecting dust for over a decade. I think that is why this sale sparked something special inside my brain. 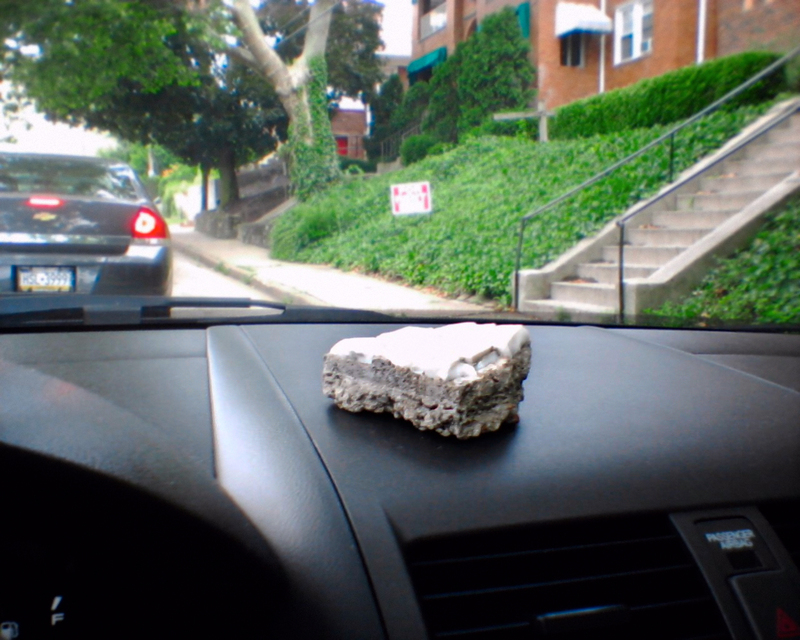 I am super excited to add Connor’s rock to my neglected collection. 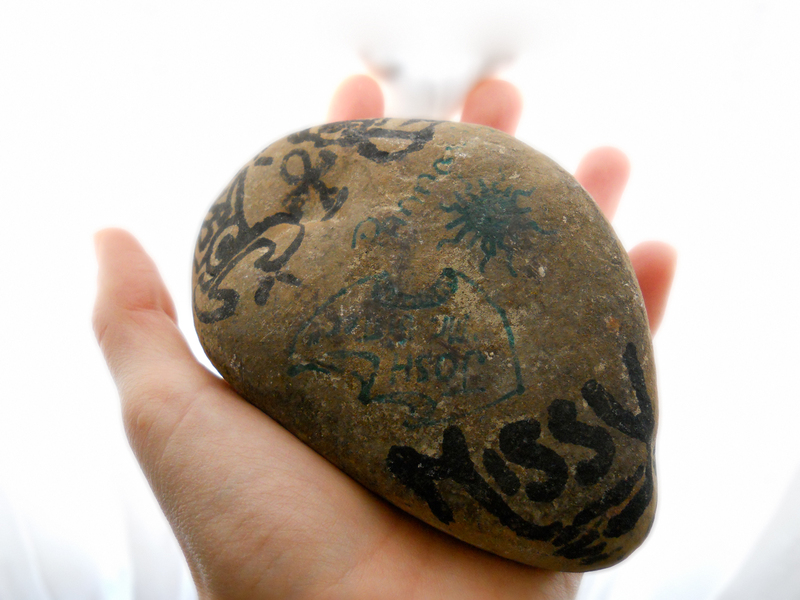 Time to dust off the cobwebs (both figuratively and literally) and appreciate some of my own “rock-y” memories. Varying locations, movie theater parking lots, "Kari" from a rambunctious parking lot experience with a dear friend. Five dollar walkie talkies were involved. We ran into Connor at the pool a few weeks later. I asked him how his rock sale went. He said it went OK and that he made a few dollars. He then asked me if I painted my rock yet. Surprised he had remembered his earlier statement (that may or may not have been a sly sales tactic), I told him that as of that moment I hadn’t. 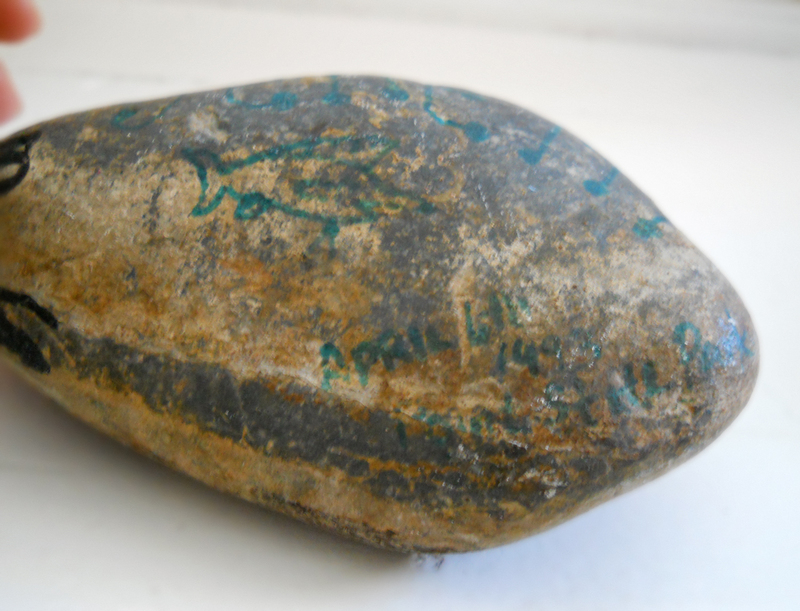 But as I said, Connor is a great salesman and everything he had mentioned regarding these rocks oozed in earnest to me, so this summer I think I just might be painting my version of “something on a rock.” I feel an obligation to his vision. Of course I am not naive. 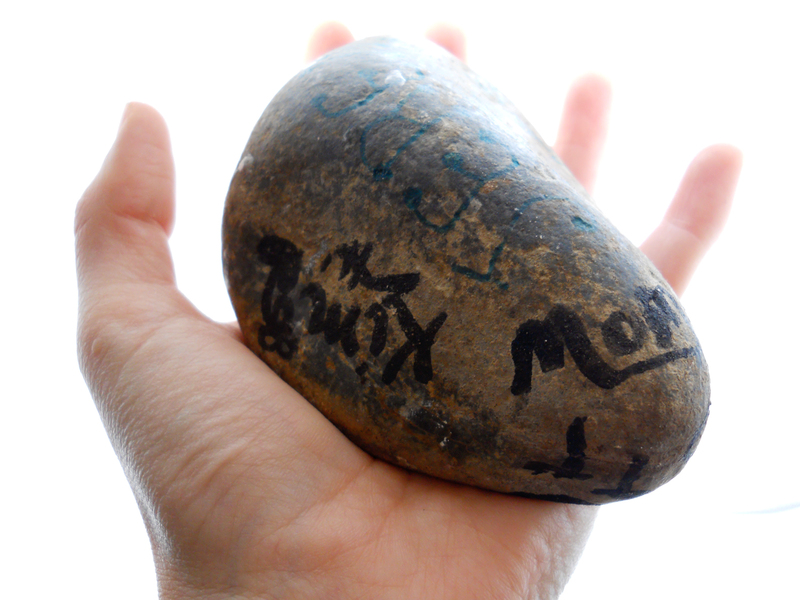 Of course I know his earnest tone may have been only in my perceptions and that he may have just hit the right heart string with sentimental old me, but I do like the idea of my rock becoming more colorful now that it has been released into in my care.